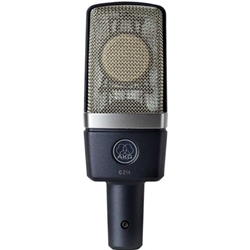 The AKG C 214 is the baby brother of AKG's legendary C 414 condenser -- a classic microphone prized for its versatility, transparent sound, and high SPL handling capabilities. Utilizing the same one-inch capsule as the C 414 and a fixed cardioid pickup pattern, the C 214 delivers comparable performance at a much more affordable price. Its fixed cardioid pattern is ideal for capturing vocals and instruments in the home studio, thanks to excellent off-axis rejection. With its all-metal die-cast body, you won't have to play nice with this microphone; it is well-suited to withstand the rigors of abrasive studio and live use. Its well-designed circuitry ensures that it is accurate at all frequencies, boasting a transparent and smooth sound with the slightest boost at 15 kHz, allowing it to cut through any mix without being too harsh. The AKG C 214's capsule is capable of handling an incredible 136 dB of sound pressure. The edge-terminated capsule rejects off-axis sound and ensures that the instrument being miked is upfront and detailed. For applications that require a complete attenuation of the low frequencies, the C 214 offers a 150 Hz low cut filter. This filter is ideal when the C 214 is being used for drum overheads, vocals, and ambient stage miking. When the low-cut filter and 20 dB attenuation pad are engaged together, the C 214 can handle a blistering 156 dB SPL, allowing you to easily handle loud sources like drum overheads and close-miked guitar cabinets. Though the C 214 is highly sensitive, it will not succumb to RF interference commonly associated with wireless systems, radio channels, and other communications devices. This means you can be confident anytime you put the C214 on stage -- nothing is going to distract this performer. If you're recording in a less-than-perfect environment, such as the typical home project studio, the C 214's integrated capsule suspension system helps you capture accurate recordings by reducing mechanical noise and resonances. The C 214's capsule has been designed with the input of professional sound engineers who were intimately familiar with the entire C 414 series. The C 214's huge dynamic range makes it ideal for close-miking aggressive vocals or loud sources like guitar amps and horns. Place the C 214 close to a source to take advantage of the cardioid pattern's proximity effect, which boosts lower frequencies at close range. You can also choose to offset this natural occurrence with the C 214's switchable low-cut filter, which rolls off frequencies below 150 Hz. Built using state-of-art manufacturing techniques and high-quality components, the C 214 will stand the test of time in even the most abusive studio situations.